One of my favorite parts of visiting my offices worldwide is exploring the ice cream freezers, just to try out the local ice cream novelties, like Heartbrand ice creams in Munich, Mövenpick in Zurich, Streets in Australia, Nestlé in Canada, Hood on the east coast, and regional offerings from Ben & Jerry's in Munich. 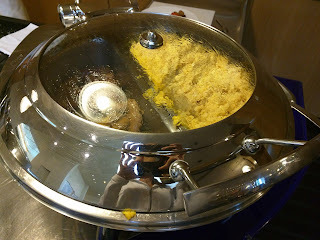 Last week, I reviewed the Trufo products I found in the freezers in my Paris office, but those freezers were very well stocked, and had many other options. 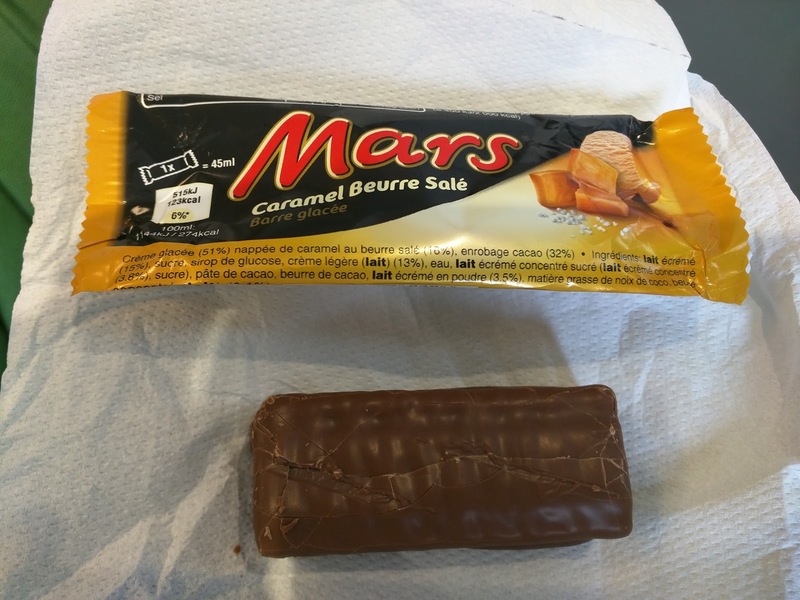 Like, Mars brand ice creams (which includes not just the ice cream versions of Mars bars, but also Snickers, Twix, Teasers, Galaxy, Bounty, and M&M). 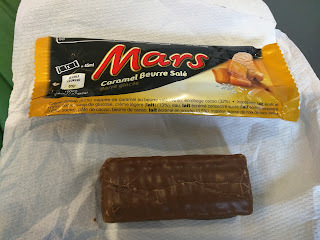 I was only able to try to Mars products, but both were about as expected: ice cream versions of candy bars, pretty generic quality, but not bad. Caramel beurre salé ... even my extremely limited French could piece this together. Caramel. Butter Salt. Salted caramel. Mars Caramel Beurre Salé: Inside. 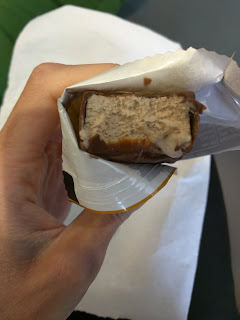 It was, as I expected, a Mars bar, in ice cream bar form: ice cream, salted caramel ribbon, chocolate shell. The ice cream inside had no particular flavor to it, I think perhaps it was supposed to be "nougat" flavor? The milk chocolate shell was standard quality for an ice cream confection. However, the caramel was thick, gooey, sweet, and pretty delicious. I liked the caramel, but everything else was pretty generic. 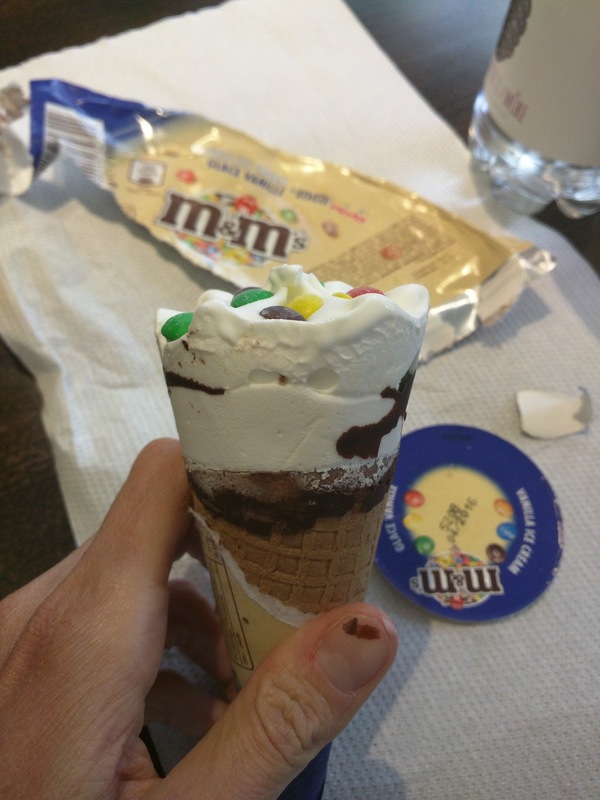 Next I went for cone, M&M branded. The ice cream inside was vanilla, and it wasn't bad actually. Fairly creamy, decent vanilla ice cream, but still just vanilla, and a bit boring. The mini M&Ms were, well, mini M&Ms. The cone was good though, very crispy, not soggy like some packaged cones get. Overall, nothing wrong with this, but very boring. During my first stay in Paris, I grew sick of the lackluster breakfast at the W where I was staying, and decided to venture outside my hotel for breakfast finally. 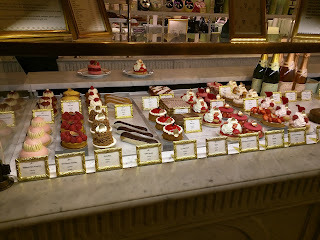 After all, I was in Paris, and there were great bakeries everywhere. 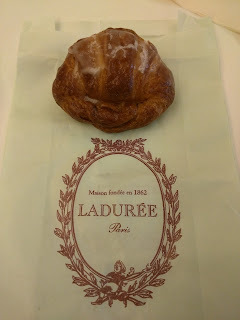 I didn't have time to stray far away to visit one of the pâtisseries on my list though, as I was in Paris for work, and needed to get to the office in a timely fashion. 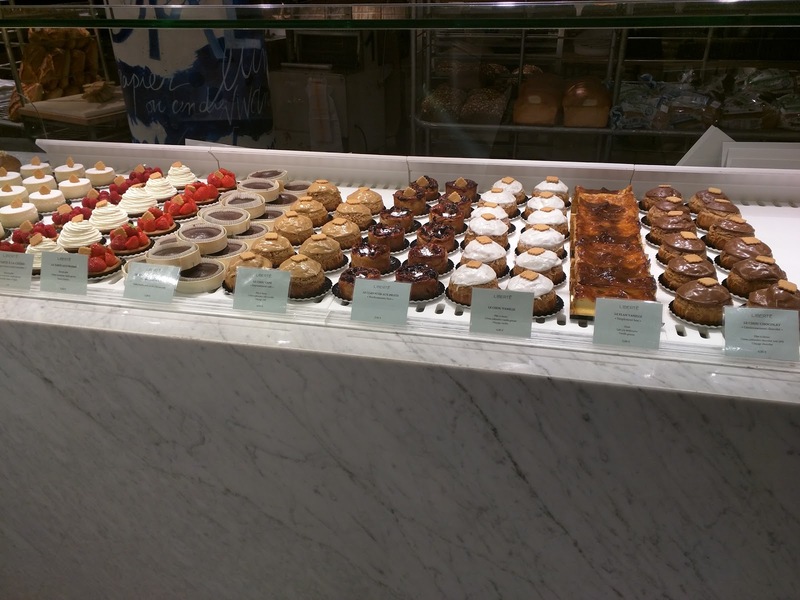 So I went to Liberté, a pâtisserie located in the food hall at Galeries Lafayette Paris Haussmann, just a few blocks from my hotel (they also have a real location, but this one was the convenient one for me and seemed more legit than any other option close by). I only tried one item, a simple croissant, and it was fine, but not earth shattering. I intended to stop by another time to get something more interesting, like the signature chocolate bread with white and milk chocolate chips that looked amazing, but, alas, I never got a chance. As it was breakfast, I moved right on past the dessert items, although I know la tarte à la crème is supposed to be notable, a sweet pastry crust, topped with a dome of vanilla pastry cream, covered in a mound of chantilly. These items all looked pretty great, and I made a note to return another time for dessert (sadly, I never did). The selection of items I deemed appropriate for breakfast however was just as large. 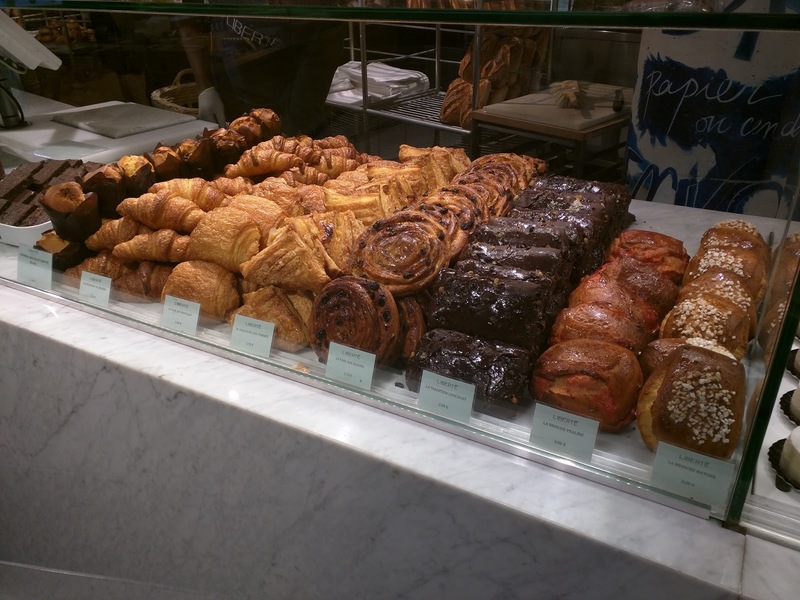 Plain croissants, chocolate croissants (sorry, sorry, pain au chocolat), apple turnovers, and raisin snails, as pretty much every boulangerie/pâtisserie in Paris offers. 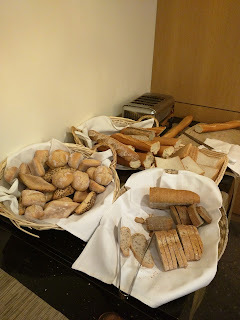 More unique were the breakfast breads: "La Tradition Chocolate", "La Brioche Praline", and "La Brioche Nature". Yes, you can argue weather these are really "breakfast", and yes, they would be suitable for afternoon snack too. They really called out to me, as they were more unique, and ... glistening. Really. 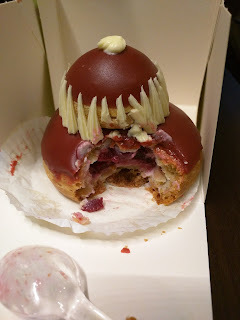 The praline brioche had a lovely pink hue, and I almost got it, but given that I couldn't make up my mind, I decided the 4€ price ruled it out (which isn't actually expensive, just, compared to the others it was double the price). Plus, I knew it would be nothing compared to the praluline, the most epic praline bread ever. The signature chocolate bread though looked incredible, studded with chocolate chips and white chocolate chips (and glistening!). It was only 2€. But it was also huge, and I didn't really want something THAT big. Plus, I wasn't even sure if I really liked chocolate bread? Le Croissant au Beurre. 1.20€. I let my indecision make me boring and opted for a plain croissant. I'd had so many sweets already in Paris, and decided that keeping it simple is actually what I needed. 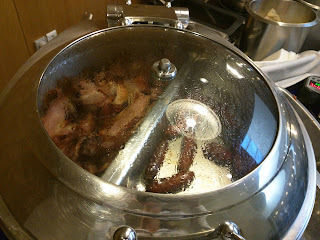 Plus, I was planning to return to my hotel (The W, where the breakfast buffet was fairly lackluster, but, had amazing jam) to eat my croissant, where coffee and jams to spread on it awaited me (I really couldn't get over those jams by the way). It was a good croissant. The exterior was flaky. The inside soft and fluffy. It was clearly a true croissant au beurre, all butter, and as decadent as a pure butter croissant can be. The paper bag it came in was quickly soaked through, but it didn't actually seem greasy or oily. I liked it, and it was far better than the croissants I encountered at the hotel or my office, but it still wasn't mind blowing. I did opt to slather it in jams, but that was just personal preference, I gave a bite to Ojan, and he preferred it plain. 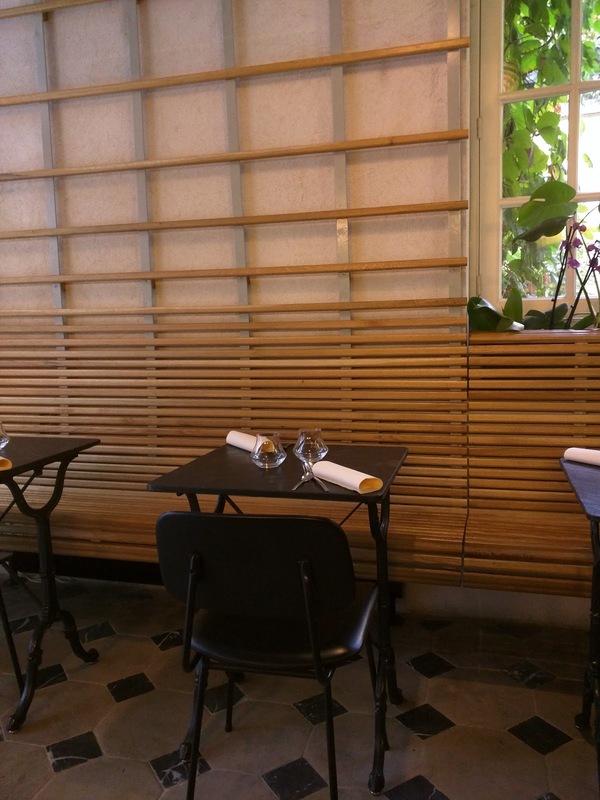 Dessance, in Paris, is a restaurant unlike any other. It is ... a dessert restaurant. Only a dessert restaurant. But not in the way you think - it isn't a chocolate cafe, or somewhere you go to load up on decadent desserts. Instead, you go for a full multi-course meal (or mid-day snack if you prefer), but, it centers around sweet highlights and techniques. I'll explain more below. 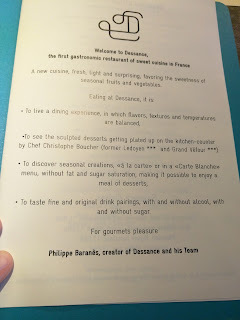 Clearly, you know how much I love desserts, so Dessance easily hit the top of my list of places to visit while in Paris. The entire experience is one of the most unique I've ever had. I've done plenty of high-end dining. I've had plenty of "concept" cuisine. Molecular gastronomy is not novel to me. 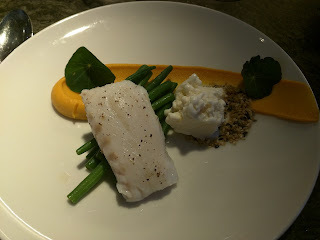 Yet, I was fascinated and engaged throughout the entire dining experience at Dessance. I was worried initially that the place was a gimmick, but really, they are doing creative, interesting work. I opted for a degustation (more on this soon), so I did not pick my courses. I didn't love several of the courses, but they are not things I would have ever chosen to order. In retrospect, I should have gone a la carte so I could focus on flavors I enjoy instead. But that said, I'm still very glad I went, I had a lovely evening, and would most certainly return (in fact, if Dessance was open again during my time in Paris, I most likely would have. Sadly, I waited until my 3rd to last day to visit, and they were closed my final two days). 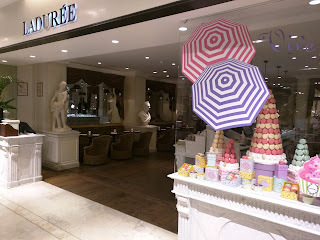 If you are ever in Paris, and want to experience sweets in a new way, I highly recommend it. The restaurant is beautifully designed. It must be fairly new. It is a small, narrow space, but it manages to feel much bigger than it actually is due to the use of mirrors. The end walls are covered in mirrored material, reflecting light and creating openness. However, as Ojan put it, the mirrors aren't boring; they have lines through them, almost like cracks but not, adding an interesting focal point as well. Pictured here is the main seating area, basically the entire restaurant, although there are a few small tables outside on the sidewalk, and a small seating area upstairs. The stairs are also mirror-lined, with the same wall length cracked mirrors. A super modern bathroom is also upstairs, with one of those amazing Dyson faucets that has built in hand dryers. (I know, this probably isn't interesting to you, but I thought it was cool!). 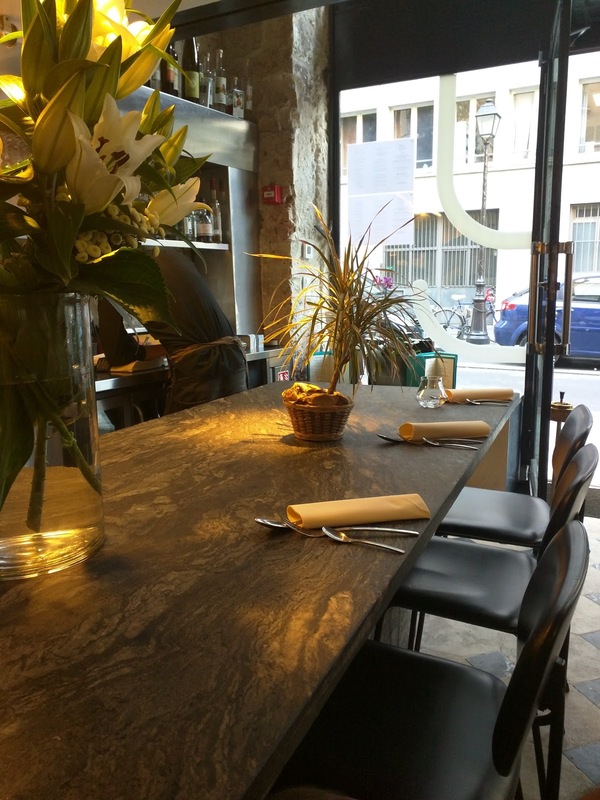 Most tables are of this style, with black slate tops, black chairs. The floor is stone, in a tiled pattern. Another fascinating element is the wood work you see here on the wall. 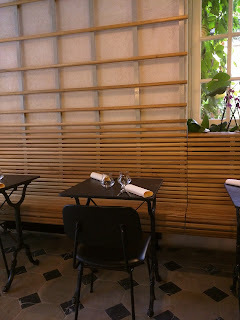 The grid of wood goes all the length of the wall, up onto the ceiling, but where it meets the table level, it actually forms the bench seating for the far side of the table. Really fun to look at. And for the lucky five, there are seats at the counter in front of the open kitchen. Since Ojan and I did not have a reservation, we went early, and were able to sit here. The counter is a gorgeous piece of slate, with a large overhang, quite comfortable to sit at. Plus, we got to watch, absolutely everything. Of course, I knew this, and that is why I immediately opted for the counter, when we were told we could sit anywhere. I love watching the action, and here, there really was going to be a lot to watch. 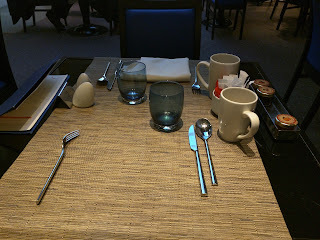 Place settings featured cutlery in assorted sizes, but I was amused that only one item, the largest spoon, was wrapped up in the cloth napkin. Also, the silverware was deliberately placed at an angle. I didn't quite understand this, but it was clearly intentional. Silverware was swapped out between each course, and changed up frequently, often including tiny little spoons. And behold ... the kitchen. Yes, for real. That is the entire thing. The kitchen is tiny. The cooking facilities consisted of counter space, a fridge, a freezer, two hot plates, and an oven. The restaurant takes the concept of a mise en place to an extreme I've never seen before. They clearly do all prep work in advance, and have everything ready to go in organized containers in the fridge, freezer, and countertop. 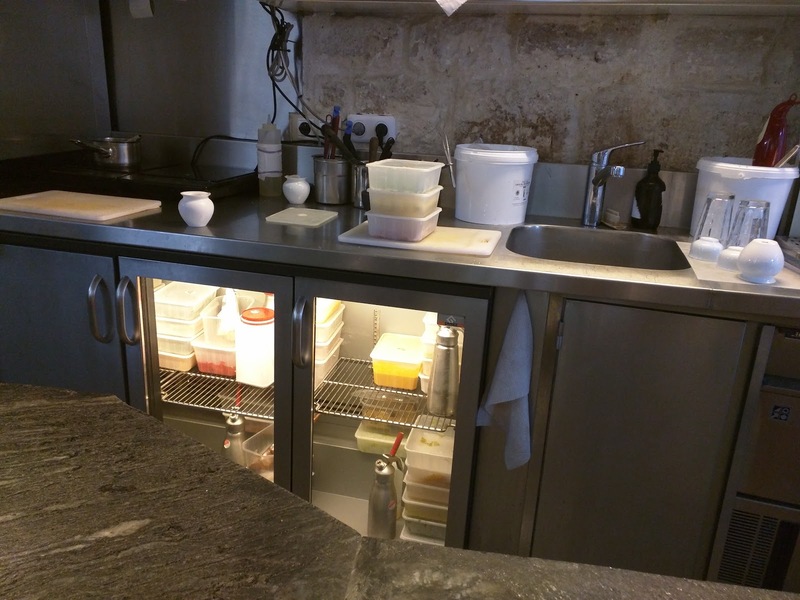 To make a dish, the chef would pull out all the containers he needed, compose the dish, and return the containers to their storage locations immediately. Nothing was ever left out, and he wiped down the counter between each dish he plated. Very, very orderly. 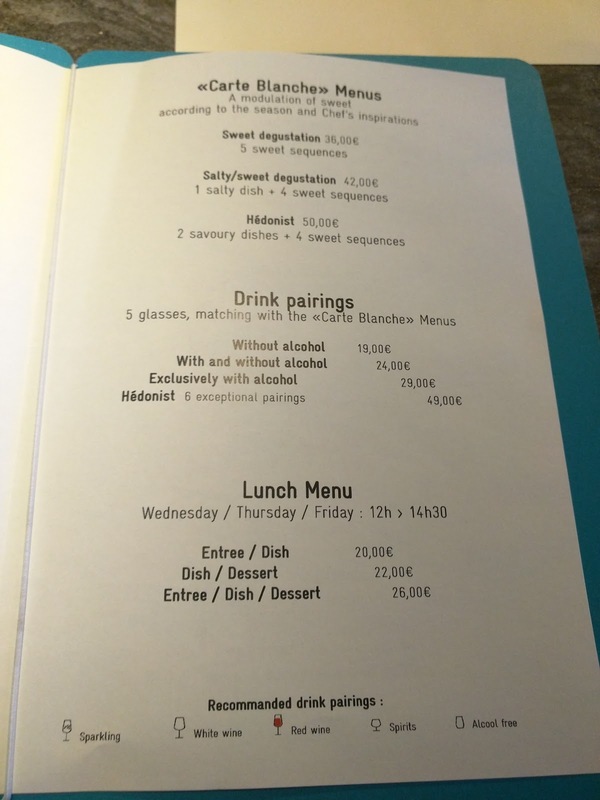 The other aspect of the restaurant is the drink program. For the degustation, you can opt for a drink pairing, and even with the a la carte, suggested drinks are listed for each dish. I'll get into the drinks more soon, but they span alcoholic drinks like wines and cocktails, but also tea infusions, fruit and vegetables juices, and even milkshakes. All drinks were prepared at the little station next to the "kitchen". I loved our vantage point. Again, open kitchens are not novel to me. The previous weekend, I had a great meal at 2 Michelin Star L'Atelier de Joël Robuchon, and sat at a counter watching their highly skilled team prepare and plate all the dishes. But this was different. We went early, very early for Paris, at 6pm. This was intentional on our part, as we didn't have a reservation, and weren't sure we wanted to do the degustation (even though we did end up getting it). After 7pm, reservations are required and they only serve the degustation. 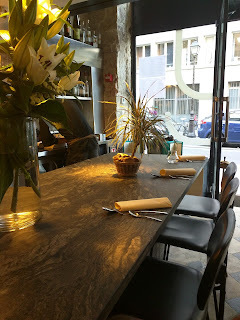 But even 7pm is early for Paris, and most restaurants only start to fill around 7:30pm. So at 6pm? It was empty. There was a small group out on the sidewalk drinking wine with a dessert, and one other pair finishing a dessert inside. Basically, the entire staff, and the chef, were ours. This created an experience like none other. Not only were we seated right before the chef, he was basically a personal chef for us. Of course, we had a huge language barrier, and it was true with most of the staff. We were greeted in English, and provided English menus, but it was clear many of the staff did not really speak English, and only a few were comfortable coming over to us to deliver dishes. With highly creative dishes like this, and a degustation menu that we didn't see (we only knew how many courses we selected), this made it a bit more ... interesting, as half the time we had no idea what we were eating. But they really tried. 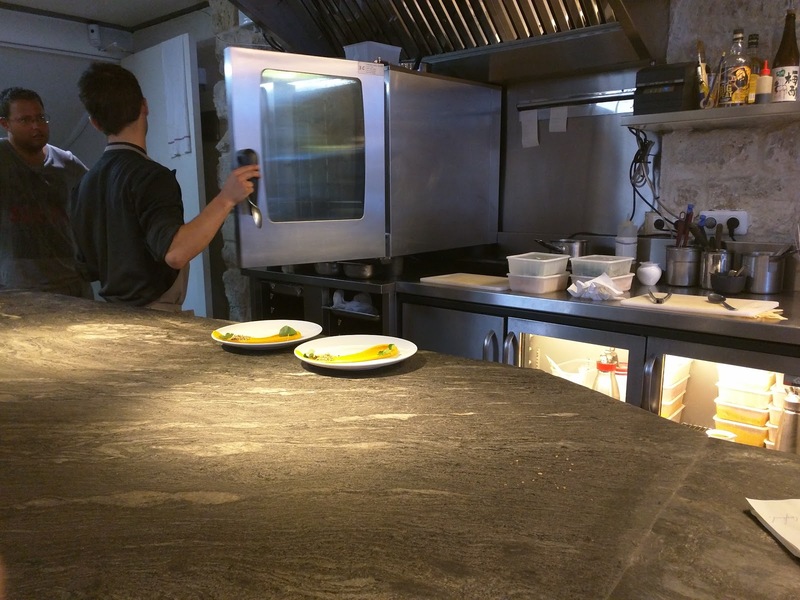 A few times, the chef finished a dish, tried to call a server to bring it to us, and the servers weren't paying attention, so the chef eventually would just bring it to us, aware that components were melting and should be consumed soon. He'd apologize that he had no way to tell us what it was. That said, the staff were quite friendly and made us feel welcome, even though we sadly didn't really speak a word of French. Watching the prep was fascinating. As I said, the chef wasn't actually doing much cooking, as the components were all prepared in advance. Only one dish was served warm, which used the oven to heat the protein, and the hotplate to warm some sides. Everything else was just assembled from cold, room temp, or frozen ingredients. But that isn't to say it was boring in any way. Each dish had a slew of components, and they didn't just come out of containers and get plopped on a plate. There were many foams dispensed out of whipped cream dispensers. Thicker creams came out of piping bags. Garnishes were grated to order. A blow torch came out often. Watching the chef was like watching a work of art being created, but it continued to boggle me how quickly he assembled a dish, while still having it come out so perfect. I honestly think no dish took him more than two minutes to complete. He's paint on a sauce, pipe on some cream, add a scoops of this or that, dispense some foam, add a garnish, and ... done! I was fascinated the entire time, and I"m sure I made for a horrible dining companion as I wasn't paying much attention to him. Sorry! 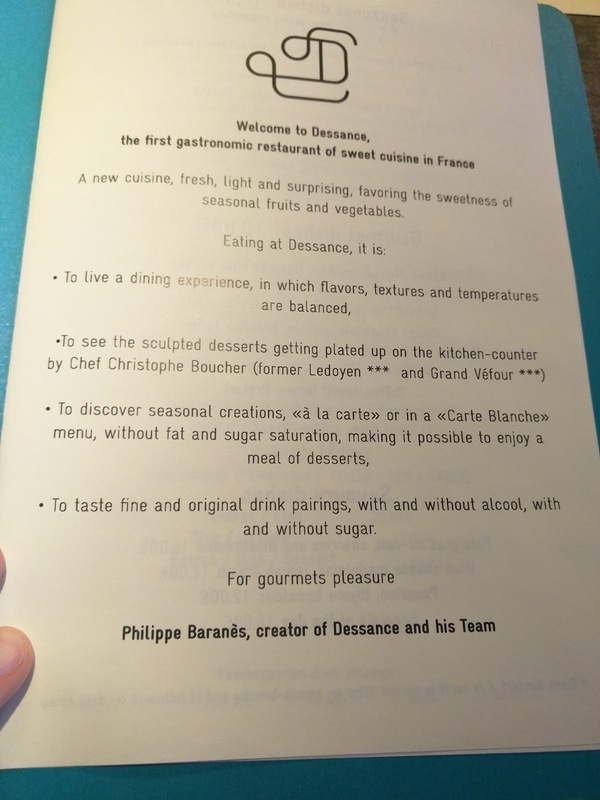 The first page of the menu had a very inspirational welcome message: "Welcome to Dessance, the first gastronomic restaurant of sweet cuisine in France". 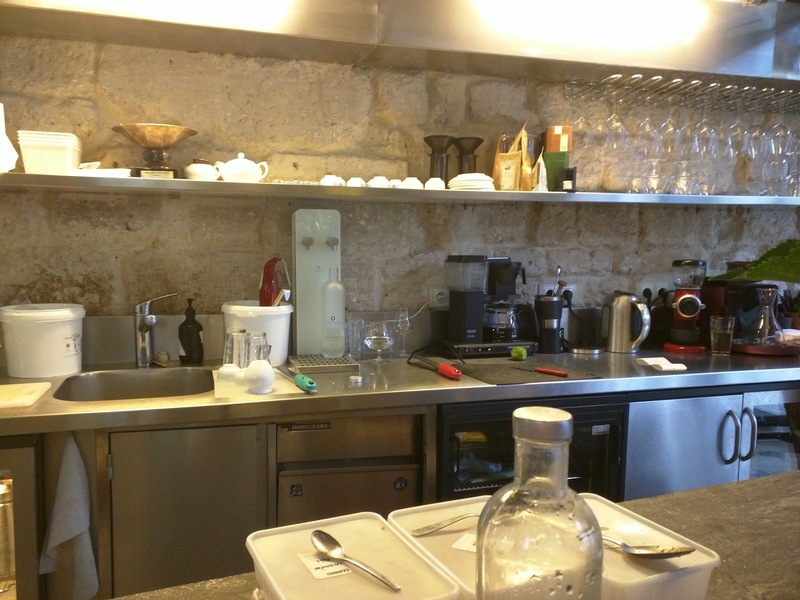 It goes on to explain the concept, a new style of cuisine, light and fresh, while sweet. They strive to highlight the sweetness of seasonal fruits and vegetables, but not load everything down with fat and sugar. The idea is that it should be possible to have an entire dessert-centric meal, without feeling gross, and while getting proper nutrition. You can only imagine how appealing this sounded to me. I love my desserts, and really often only eat "real" food because I know I have to. 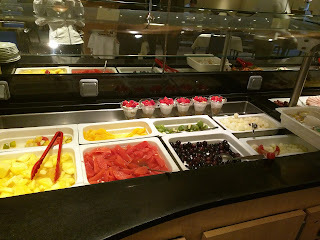 Here, they were telling me that I'd get a full meal, leave feeling healthy, and still get all desserts? The next page of the menu is the a la carte menu, with 6 different desserts, all 19€ each, and 4 savory dishes. As I mentioned earlier, this menu is only available during the day, pre-7pm. The a la carte menu was very tempting. For savories, a foie gras mi-cuit with cherries and mushrooms. And blue cheese madelines with lemon cream. Some crazy tomato and pecorino dish. I wanted them all. And desserts too, including Baked Alaska, smoked and flambéed with whisky, with a suggested pairing of whiskey of course. Another included celery, ginger ice cream, and Speculoos and had a suggested milkshake drink pairing. So many things I wanted. If you order desserts a la carte, they come with an amuse-bouche, and are followed by a platter of delicacies too, so you aren't *just* getting dessert. We could easily make a meal of a couple savories, each pick a dessert, and be happy. 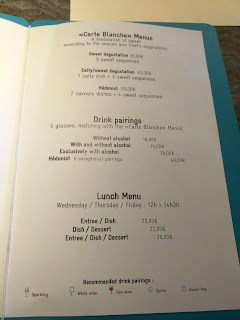 We'd have amuse-bouche, 3 or so savory dishes, 2 full desserts, a couple drink pairings, and parting little bites. A full meal, but not overboard. And given the amount of pastries, cream, and butter I had that day/week/trip, a light meal honestly sounded good. We *almost* did this, and in retrospect I wish we had. But we opted for a totally unknown degustation. It seemed like if we were there, we might as well just let them shine. 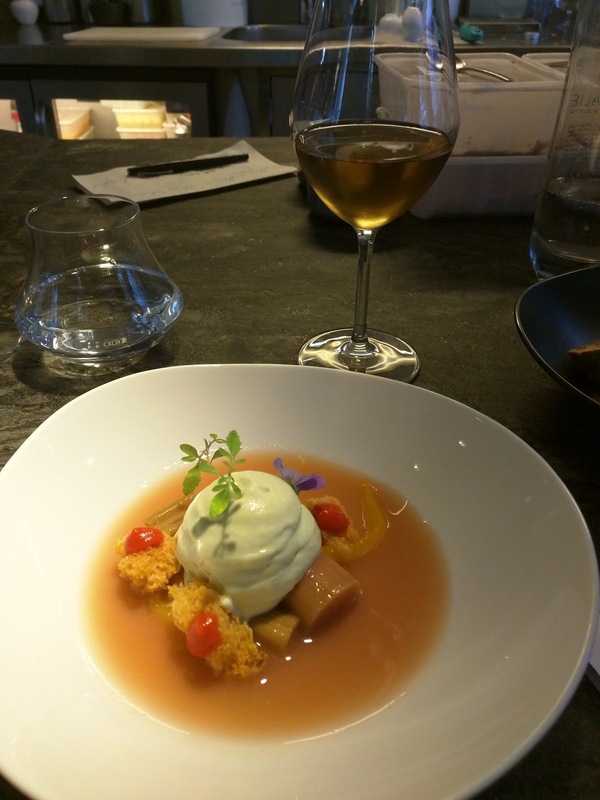 All the menu said was, "A modulation of sweet according to the season and Chef's inspiration." Well, ok then. Bring it on. We did have some options. The "Sweet Degustation" is 5 courses of sweets only for 36€. 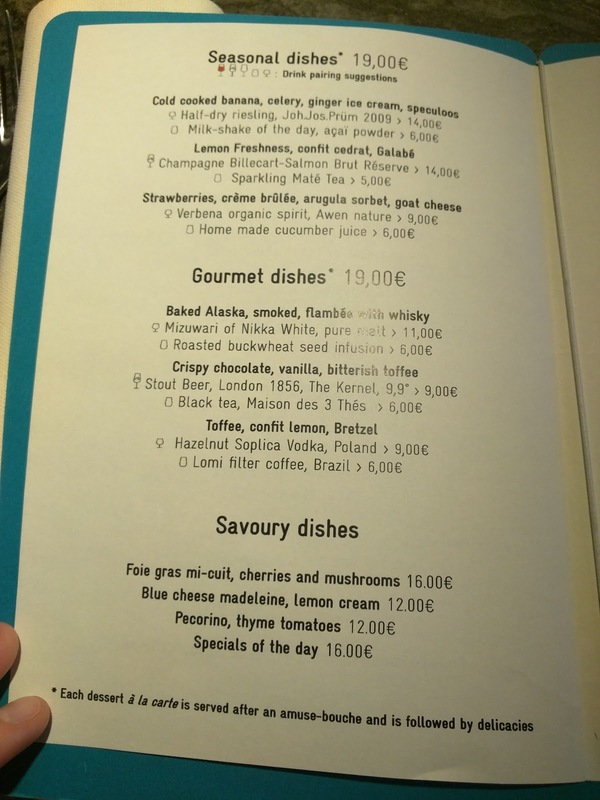 The "Salty/Sweet Degustation" swaps out one sweet for a salty dish, for 42€. 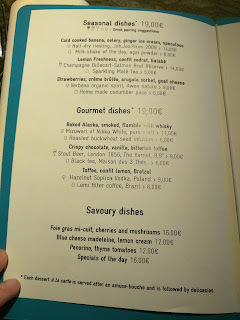 And finally, the "Hedonist" adds a second savory for 50€. Being "responsible" at a dessert restaurant, we opted for the middle choice, which would have one savory course. One savory, four sweet, bring it on! The 42€ price was very reasonable, particularly once we saw that our savory course was seafood, and just how large all the portions were. 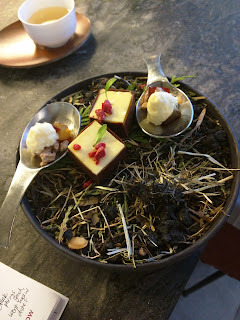 And of course, we also got an amuse bouche and a platter of treats at the end. We also had our choice of drink pairings. You could get completely alcohol-free pairings for 19€, exclusively alcoholic for 29€, or a mix for 24€. Since Ojan can't drink alcohol, and we thought that each doing a pairing might be a bit much, we opted to split one, and selected the mixed pairing. I'd drink the alcoholic ones (and he could try a sip to see how they went with the dishes), and he'd drink the non-alcoholic (and I'd do the same). In the end, it turned out to be 3 alcoholic and 2 non-alcoholic. The drink pairings all really did enhance the food, and were not boring expected pairings. The only problem we had is that 3 very large pours of wine, in a fairly short time period, turned out to be a bit much for me. Let's just say, that walking back to the hotel was a bit harder than expected. We opted for sparkling water with the meal, served in fun shaped glasses. Amuse Bouche: "Mustard and Fries". Our meal started within three minutes of ordering, with a cold amuse bouche. It was described as a little snack to get us going, and stressed that it was not one of our courses. I'm pretty sure our server said this was "mustard and fries". But, uh, what was it? The most interesting component a light, fluffy foam, subtly mustard flavored, dispensed from a whipped cream dispenser. On top was a single crunchy, salty potato chip. And under the foam was a fine chop of ... something. We first thought it might be daikon radish, but later decided it must have been potato, perhaps raw potato? This really was fascinating. I liked the play of textures, the raw grated material in the bottom, the amazing foam, the crunchy chip. Was it tasty? Not really, and in fact, my second to least favorite dish of the meal, but really interesting. 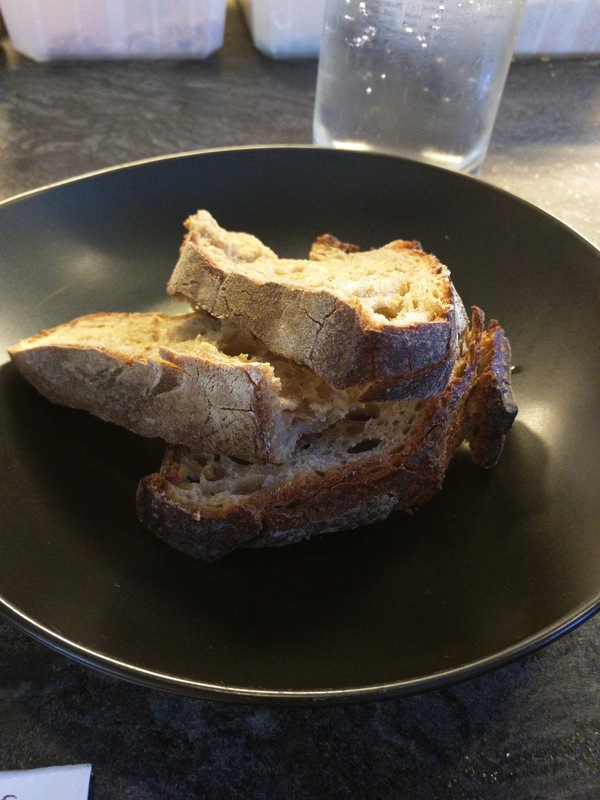 At the same time as the amuse, a bowl of bread was brought out. It was actually toasted, not just warm. Bonus points for nice, crusty bread, but, alas, sourdough, which I do not like. Drink Pairing #1: Sauvignon Blanc. Four minutes into our meal, the first drink pairing arrived, a wine pairing, sauvignon blanc. Slightly drier than I'd normally opt for, but I did like it. It was very refreshing, and most welcome on a very hot day (the restaurant does not have AC). It went well with the first course, the savory one, seafood, which arrived two minutes later. Course #1 (Savory): Sea Bream. Yes, literally six minutes after ordering, our first course was served. This was our "Savory" course. This was our only hot course, and our only savory course. So what was it? Sea bream, on a bed of hericot verts, with sweet potato and passion fruit mash, sesame oil "ice", and crunchy sesame. Let's start with the easy components. The green beans. Just a pile of decently cooked, thin, hot (temperature wise), green beans. I thought they were really boring, but Ojan really, really liked the beans. He kept talking about how great they were, both on their own, and paired with the fish. He really liked them with the fish, more than I've seen him appreciate most food pairings. When I left some of mine behind, he gladly took them all. The fish was sea bream, served warm. I would have preferred if it were hotter, but it was warmed up in the oven, and you obviously wouldn't want it to dry out. It was moist, tender, lightly seasoned, perfectly ok, but like the green beans, not exactly exciting. Things got more interesting with the sweet potato and passion fruit mash, which you can see sorta spread onto the plate in the back. This was piping hot, warmed up in a pot on the hotplate in the "kitchen". It was sweet, with a really fascinating flavor, sweet potato mixed with passion fruit, which tastes just as confusing and interesting as it sounds. It was very creamy, more of a puree than mash as advertised. I liked this for the novelty, but it didn't really go well with the fish or the beans, as it was just a bit too sweet. I'm not sure what the two leaves were as garnish on top of the puree. The dish got far, far more interesting with the sesame components. The strange white blob you see on the plate is what they called a sesame oil ice, which turned out to be ... cold ice cream, on top of assorted crunchy sesame seeds. There was so much flavor to this, both in the ice cream itself and in the seed mixture. I absolutely loved it, very Asian flavors, just in a very unexpected way. And the sesame flavors go great with fish, or with beans, for sure. But ... do you really want to put cold ice cream on your warm seafood? I just couldn't quite figure out how to combine these things, but wow, I loved the sesame components. Overall, this was a mixed success. 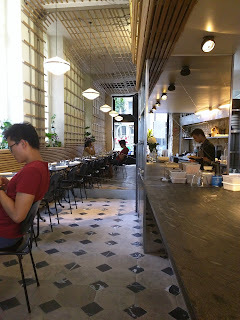 Ojan loved the beans, I loved the sesame stuff, but it wasn't really a cohesive dish, and it didn't seem like the kitchen was showing off much cooking talent. Then again, savory is not what they are known for. 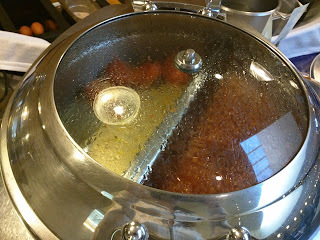 Still, it had good flavors, particularly the mash and sesame, and was fascinating to eat, if nothing else. My fourth pick of the meal. The moment we finished our seafood, the next course was placed in front of us. This was dubbed the "refreshing" course, a small palette cleanser, designed to ease us into the sweeter rounds, after our savory start. When my dish was placed in front of me, alarms went off in my head. It sure looked like watermelon, but I had told them, several times, about my allergy, and it seemed well understood. Since I knew they were doing all sorts of molecular work, I kinda assumed it must be something like compressed tomato, that just looked a lot like watermelon. Except ... it also smelt like watermelon. No description was given when it was placed in front of us, so I decided to be safe and call someone over to ask what it was. Yes, watermelon. ZOMG. Near death. Course #2 (Refreshing): Strawberry. Drink Pairing #2: Homemade Cucumber Juice. Ojan kept his, but mine was quickly swapped out, the chef whipping up a version that replaced the watermelon with strawberries. This dish, and all remaining dishes, were room temperature, or chilled. 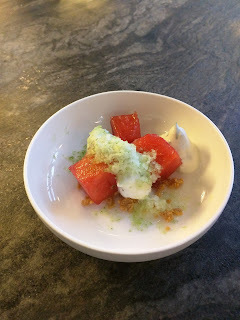 So what we had here was strawberries (or watermelon), with a cream, a peanut crumble, and shaved cucumber on top. My strawberries were not very good, rather mushy. I have no idea what the cream was, I wasn't able to identify any unique ingredients. I did like the flavor for the peanut crumble. The most interesting bit of this dish was the cucumber, which had been frozen, and then grated over the top, creating a granita almost, a cold, refreshing element. I didn't really like this, but it did make for a good transition from savory to sweet. My least favorite dish. 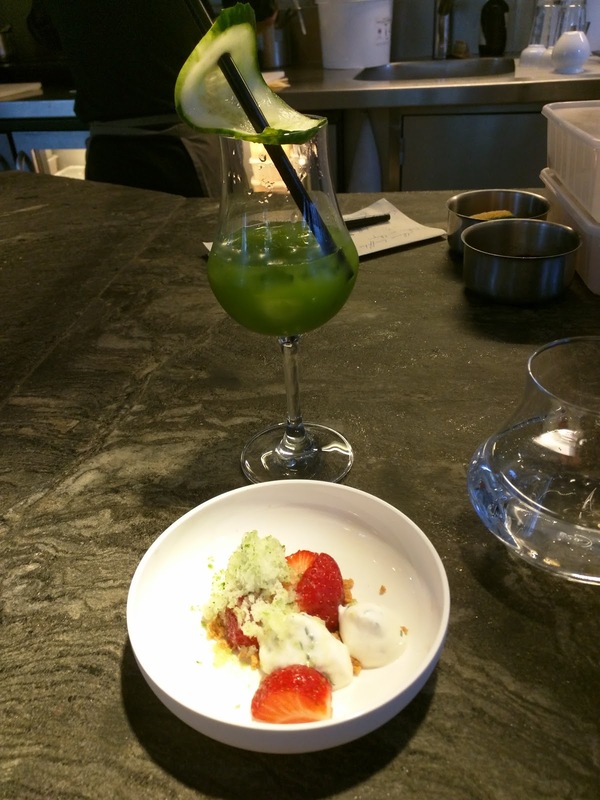 The drink pairing for this was non-alcoholic, homemade cucumber juice, available for 6€ on its own as well. It was ... well, cucumber juice. 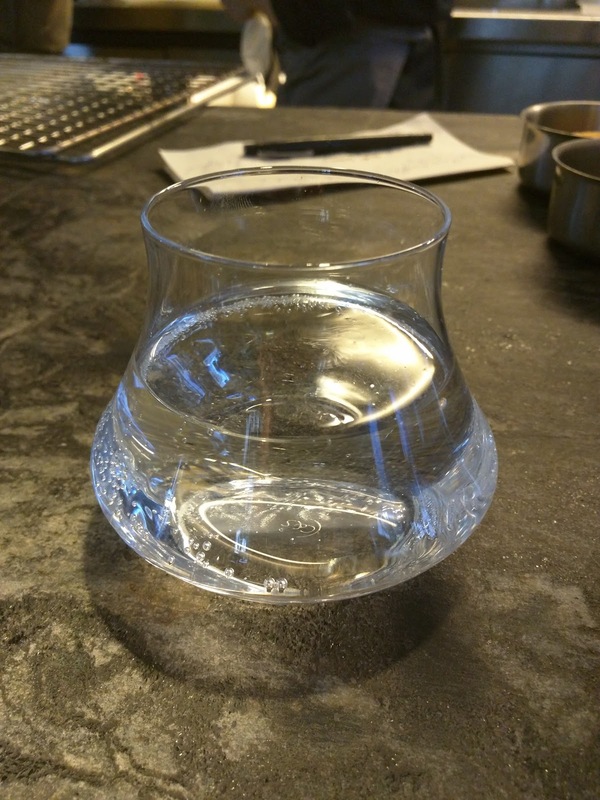 A very strong cucumber flavor, balanced with a bit of lemon for acidity. It had cubes of cucumber floating in it as well. I thought it was way too strong, but Ojan liked it, and said it was refreshing. I was happy to let him have this one. I still had a ton of wine left, as it had only been about 8 minutes since I was served the wine, and I'm not THAT fast of a drinker. Course #3 (Sweet and Tart): Rhubarb. Drink Pairing #3: Sour Riesling. The meal continued at a rapid pace, again, the moment we put down our forks, our next course was brought out. I didn't have a chance to sip my wine, let alone jot down some notes, before another course was being described, another glass of wine placed in front of me. I think this was likely due to the fact that we were the only diners, so the chef was just proceeding through the courses as fast as he could make them. 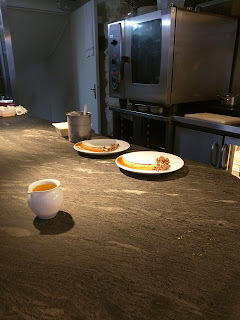 At this point, I asked to have things slowed down, as I realized that I wasn't getting a chance to appreciate the dishes, take them in, and I most certainly couldn't keep up with the drinking. So from savory, to refreshing, and now for our third course, getting a bit sweeter, but also tart, dubbed the "Sweet and Tart" course. And again, the big question ... what is it? Here we had stewed chunks of rhubarb, in a fruit soup, with pieces of a yellow and red pepper biscuit, and tarragon foam. The rhubarb was just stewed, soft, rhubarb, very tart. I don't like rhubarb, so this was a pretty big disappointment to me, as it was a central element of the dish. The fruit soup was a chilled broth, both sweet and tart, very refreshing, although the flavors were so strong, you couldn't quite just lap it up. The yellow and red pepper biscuit pieces were fairly amazing. Yes, they tasted exactly like bell peppers. The pieces were crunchy at first, but as they soaked up the soup, they quickly softened. This also infused them with some sweetness. On each piece of the biscuit was also a dot of red pepper puree, again, crazy flavorful. The best part however was the tarragon foam, again, something that came out of a whipped cream dispenser. The restaurant sorta overused that dispenser, but, I tended to love these components, so I didn't mind the excessive use. This was light and fluffy, creamy, with wonderful tarragon flavor. It was also fairly sweet. So ... how did I feel about this one? Since I don't like rhubarb, it was fairly ruined for me, but it was somewhat refreshing, in a way that made no sense given just how tart, and how sweet, it was. My second favorite dish of the night though, because the foam was delicious, the biscuits were fun, and the dish was really fascinating. 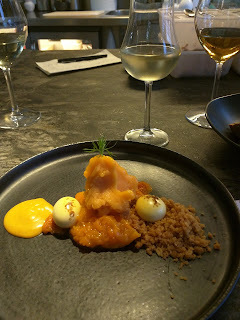 The drink pairing for this was another wine, this time a riesling, 2012 Julien Meyer. 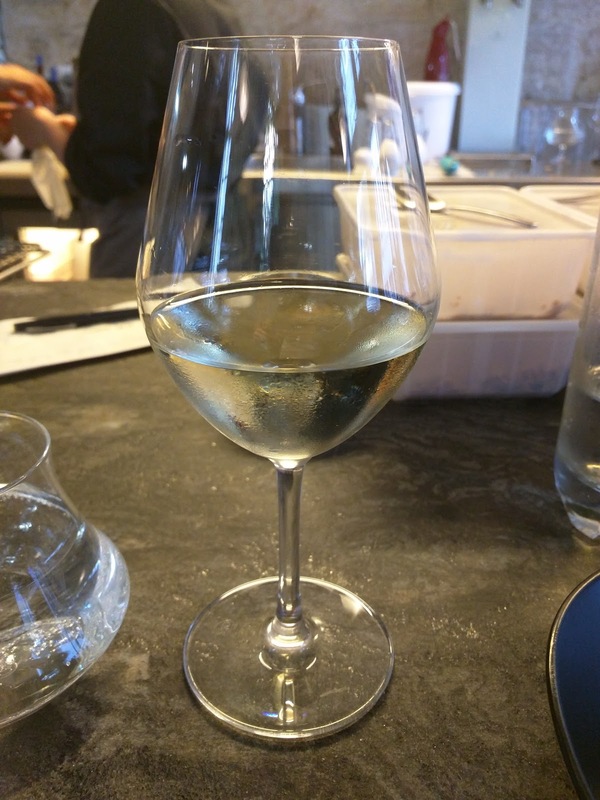 It was the most interesting riesling I've ever had. It was ... sour. It tasted like a cider, not like a wine. Just like the food, I found myself really fascinated by this wine. And it really was a great pairing with the dish, sour with tart and sweet. 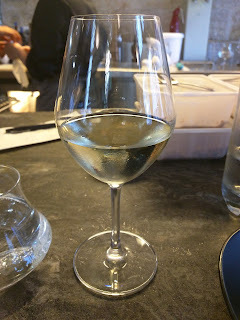 I'd love to try this wine again in another context, as I wonder how much my tasting it as sour had to do with the overload of sweet and tart I was experiencing with the food. Course #4 (Sweet) : Apricot. Drink Pairing #4: Sweet Riesling. Moving on to a truly "Sweet" course. Another course, another main ingredient I don't care for, and another confusing few minutes of playing "what on earth am I eating?" Here we had ... an apricot based dessert. I don't dislike apricot as much as rhubarb, but, it is never a favorite. At this point, I was sad that I had ordered the degustation. Not because they weren't making good dishes, but because I was fully aware that I just wasn't liking them due to the ingredients used, and that the a la carte sounded much more like what I wanted. But, anyway. What did we have here? A bunch of things. First, just a ton of slightly stewed apricot. It was very sweet, and strangely stringy. I didn't really like the fruit. On top of that was sorbet. I didn't expect to like it, because I never care for sorbets, but this was really good, apricot and laurel. Really tasty, but quite sweet as well. 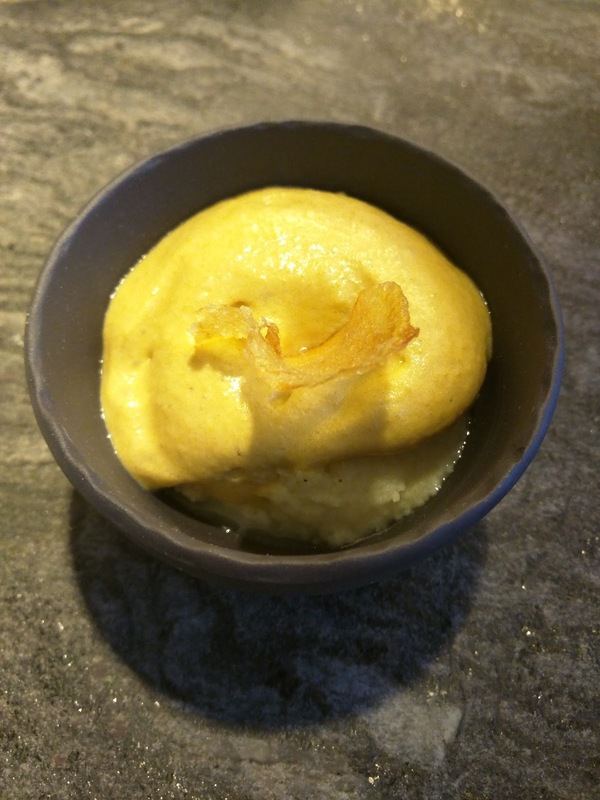 On either side of the apricot and sorbet were two spheres, torched with the blow torch right before serving, filled with a lemon liquid. The sauce on the side was added to the dish at our seat from a little pitcher, made from the kernel of the apricot. Our server had a very hard time explaining this, but we eventually figured it out. And finally, the crumble, infused with olive oil, which gave it a savory element and some texture. Neither Ojan nor I could really figure out what to do with this dish. I'm all about finding those perfect bites, where you combine the right elements in a way that the sum is greater than the parts, but here, we just didn't know how to make that work. Ojan gave up at one point and just said, "I have no idea how to even eat this dish". He also reflected on how it was really just a lot of the same flavors, with no way to mix and change it in any way. Sweet apricot fruit, sweet apricot sorbet, sweet apricot sauce. I thought this dish was just way too sweet. But Ojan thought it was a bit tart too. This made no sense to me, as I was just blown away by sweetness from the apricot. Anyway, I didn't like it, but the sorbet was good, and the savory olive oil crumble was a nice surprise. My third pick due to the tasty sorbet. The drink pairing here was another riesling, but this one was a sweet one. It was really delicious, I loved it, but, the very sweet drink with the very sweet dish was too much. Course #5 (Sweet): Salted Caramel. Drink Pairing #5: Buckwheat Tea. And here we had it, our final course, another "Sweet" one, the sweet finale. And what a finale it was. Salted caramel was the theme. Caramel was everywhere in this dish. Finally, a star ingredient I really like! Painted on the plate was salted caramel sauce. Then we had a scoop of salted caramel ice cream. And salted caramel foam. The ice cream was insanely creamy. I have no idea how they achieved this texture. It was incredible. So creamy, some of the best ice cream I've ever had. I loved it, and that ice cream alone made the entire meal worthwhile. However, this dish had plenty more to give. The caramel foam was another light and fluffy charged component. Under the foam however was ... lemon sorbet! This was very unexpected, and, as I mentioned earlier, I don't really like sorbet. I also don't really like lemon dessert. But somehow, this actually almost worked. Salted caramel and lemon? Who knew. It really did combine with the caramel nicely, but, it got to be too much. Perhaps with half the quantity of the sorbet it would have really succeeded. And then, for some crunch, because every good dessert needs crunch, chocolate praline coated pretzels, crumbled up. They added the necessary crunch, but also some salt, and another texture to the dish. Overall, this was really just awesome. 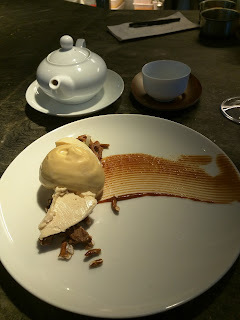 The ice cream was amazing, I really did love the foams throughout the whole meal, and you can't go wrong with praline pretzel bits. It was sweet, it was creamy, it was the perfect ending to the meal. It made me realize that when they work with a primary ingredient I like, they do a very good job with it. Again, I wished I had opted for a la carte so I could have had more dishes I actually wanted. Hands down favorite dish of the night. The pairing for this was a hot tea, a roasted buckwheat seed infusion, normally 6€. It was served in its own little pot. It was slightly bitter, and went nicely with the dessert, but given the extremely hot weather, a piping hot beverage is not what we wanted. And finally, some parting sweet bites. In the spoons was "plum and white chocolate". This was just cubes of plum, topped with sweet white chocolate foam, and soft pieces of chocolate. It was fine I guess, but, not particularly interesting. The other was "vanilla creme brûlée", which sounded exciting since I love creme brûlée, but wasn't actually creme brûlée at all. It was just a vanilla pudding in a chocolate shell. This was funny, since they used the blow torch at other times in the meal, and clearly could have brûléed it if they wanted. We weren't sure what the little red things were on top. These items were served in a bowl with rocks, hay, and other elements. Which was ... not really ideal, since the creme brulee bites were sitting in it, and got bits of hay stuck to them. Can't say I understand this plating. Not the strongest finish, but, we were so in love with the caramel dessert that we didn't really mind. 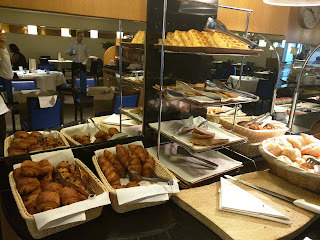 As you read last week, I stayed two nights at the Sheraton located at the Charles de Gaulle airport in Paris. 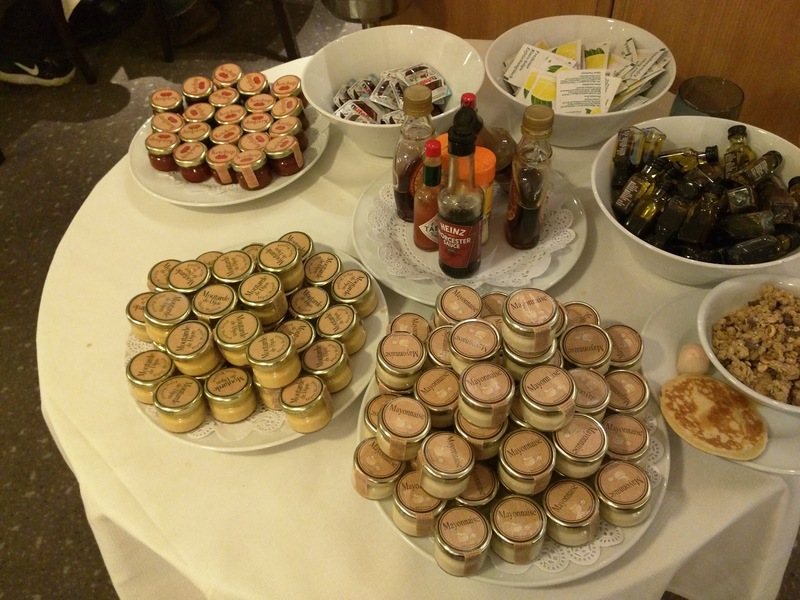 The evening canape selection was very disappointing in the makeshift Executive Lounge, but breakfast was served in the full restaurant, Les Etoilles, so I had hope that it at least was being prepared in a real kitchen. 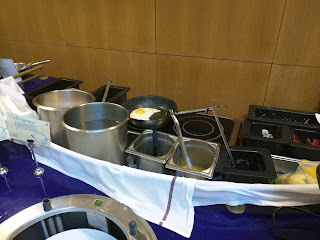 Breakfast was a large buffet, with continental and cooked items, plus a made-to-order egg station. It was poorly managed. Many stations ran out of food and were not replenished in a timely manner. Nothing was labelled. The food itself had lots of duds, but there were few decent items. 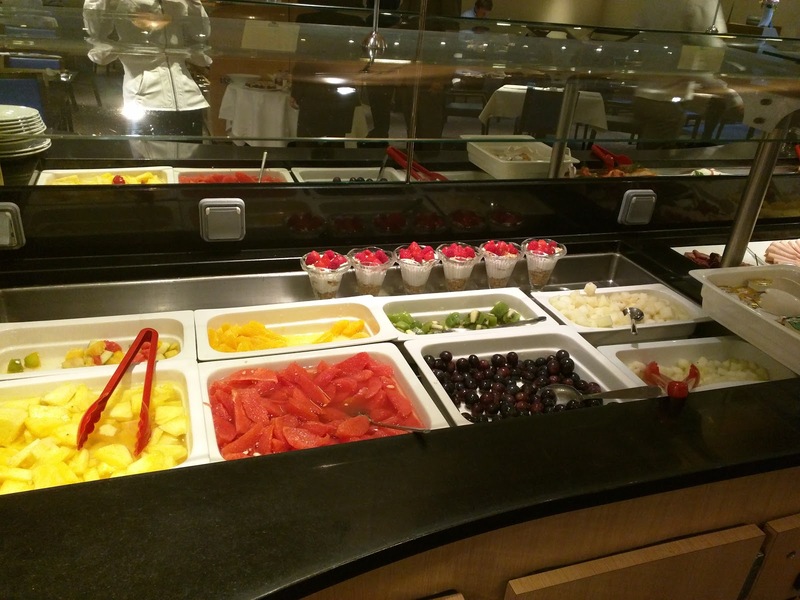 I was quite happy with my made-to-order eggs and my cereal, not items I'd normally opt for. But overall, certainly not worth the regular price (included in my stay as a Platinum guest). Tables were set with basic silverware, cups, and mugs. This made it seem like coffee and water would be provided at the table, but actually, you had to take your mug from the table and go to coffee machines, or drink station. It would have been easier to have the cups/mugs provided at this station rather than at the tables? 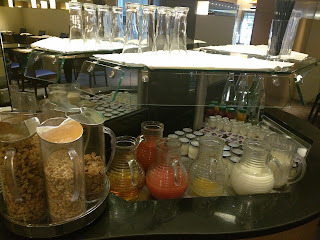 I actually prefer being able to help myself to drinks, most hotel breakfast buffets have you order drinks from a server, so this is just a minor nit. 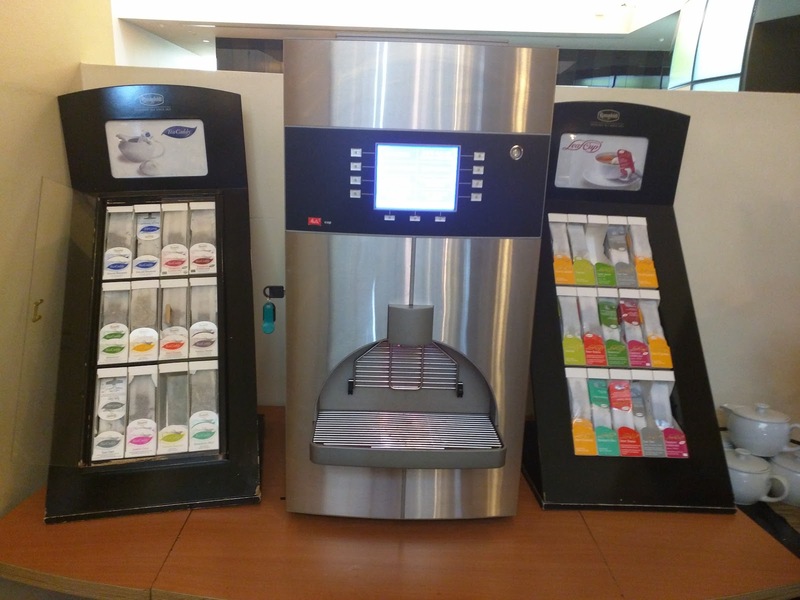 Coffee and tea were self-serve. 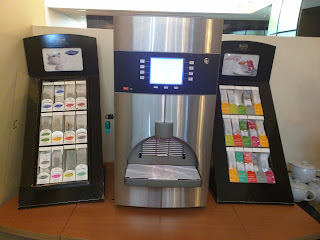 The robot machine did grind whole beans (regular and decaf), and made assorted lattes, cappuccinos, and basic espresso. I opted for a few decaf Americanos, and they were fine. Not great, but not bad. The teas looked decent quality, and tea pots and a hot water dispenser were on the side to brew a pot at a time, as seems customary in France. I never saw anyone just get a single cup/mug of tea anywhere. No rooibos tea offered. Cold drinks were a few assorted juices and milk. None of the multiple milks were labelled, but when I looked at them quizzically, a staff member told me one was skim and one was soy. It really seems like there should have been labels on these at least, as it is really not obvious what is soy milk from looks. Cereal was corn flakes and other basic Kellogg's offerings, but an interesting looking granola. 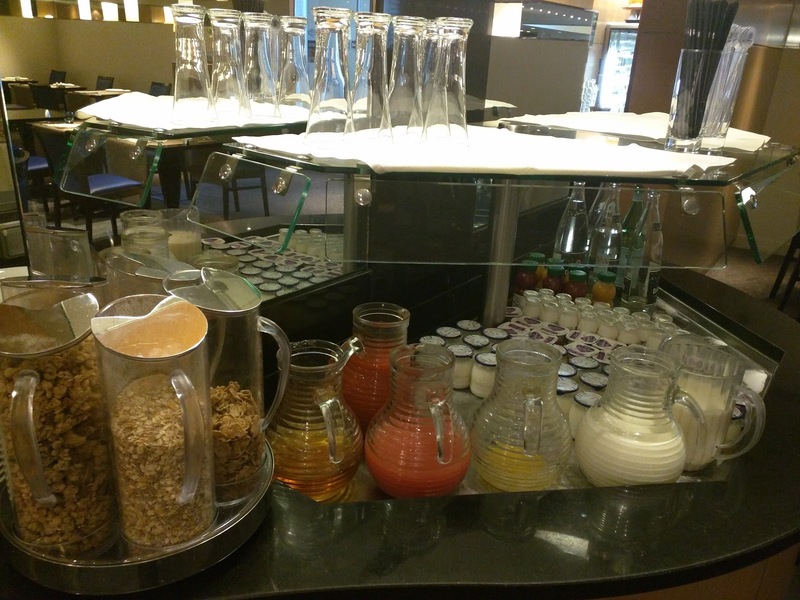 I opted for the granola, and tipped the dispenser over a bowl to pour some out. The lid immediately fell off, and all the granola dumped everywhere. Grumble. Perhaps get some dispensers with lids that actually attach? I'm still not sure what I did wrong, it looked like it was meant to pour. Drama aside, I did really like the granola, and wish I knew what it was. Large clusters, with bits of chocolate and hazelnuts too. I didn't try the yogurts, but they looked like the same selection that was available in the club lounge the previous evening. The toast station was ... sad. Two baskets with a few slices each, and a toaster sitting off on the side. 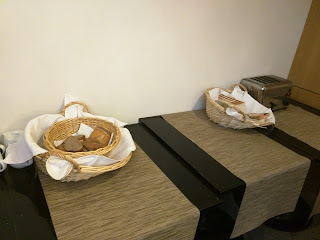 It was only 9am when I arrived, and they had service for another hour, but clearly this area had been depleted and not replenished, as the two small baskets baskets were each inside larger, empty baskets. The next day, I arrived at 7am, and the pickings were much better. Baguettes were included as well. This made more sense. Protip: come early for bread. Moving on to hot foods. The bacon was flabby and horrible looking. The sausages however somehow appealed to me. They were shriveled up, horribly greasy, but, for some reason, I wanted them. So I tried one. I know it was gross, but I liked it. The casing was crispy and shriveled. It was insanely oily. But ... I liked it. What can I say. I was in the mood for sausage? Ojan just laughed at me. I didn't try the roasted tomatoes or baked beans. Again, quantities were low, and they still had an hour of service remaining. 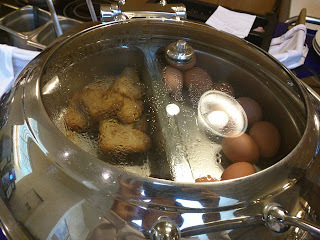 The hashbrowns didn't look fully cooked, and hardboiled eggs aren't interesting, so I skipped. Next was another type of sausage, fatter, lighter colored, not as greasy. Perhaps chicken sausage? I didn't try these and again wished items were labelled. The scrambled eggs looked dried out and horrible. I guess there is a reason this was still full, when everything else was near empty. Made to Order Egg Station. The hot food all surrounded a made-to-order egg station, manned by a chef. She had the makings for omelets and eggs any way you wanted them. I opted for two eggs over medium, with sautéed mushrooms and cheese. This was an ambitious order, given the langauge barrier, but I was delighted when I saw her sautee the mushrooms in the pan alongside the eggs, so they'd be fully cooked. She didn't really melt the cheese on top, and the eggs weren't quite over medium, but overall, it was almost what I asked for. And ... I liked my eggs. Yes, just fried eggs, but decently prepared. The mushrooms were great, perfectly cooked. And the cheese ... tons of it, and it did melt somewhat from the hot eggs. I have no idea what kind it was, probably a generic cheddar, but it went nicely with the eggs and mushrooms. I added salt and pepper from the table, and devoured my eggs happily. I really was in a strange mood this day, as I'm not usually excited for eggs! Now we were getting to the good stuff ... or so I though. Baked goods! In one basket was chocolate croissants, in another regular croissants. On the tiered stands were waffles, pancakes, and crepes. The fourth tier was empty, I'm not sure what was there before. A large bread board with crumbs and a knife indicated that perhaps there were baguettes earlier? A basket of hard rolls were on the side. I gleefully grabbed a waffle and a crepe and then realized something. They weren't under any heat source. I looked around for a conveyor toaster to warm them. Nothing. I walked over to the regular toaster, far away from this area. I tried to fit my waffle in. It didn't fit. Cold waffles, pancakes, and crepes? Um, what? I tried a few halfhearted bites, but these just weren't good. For toppings, there was butter, and jam on the tables, but wow, fail. (Edit: there was a condiment station I didn't see the first day, that did have some better toppings). 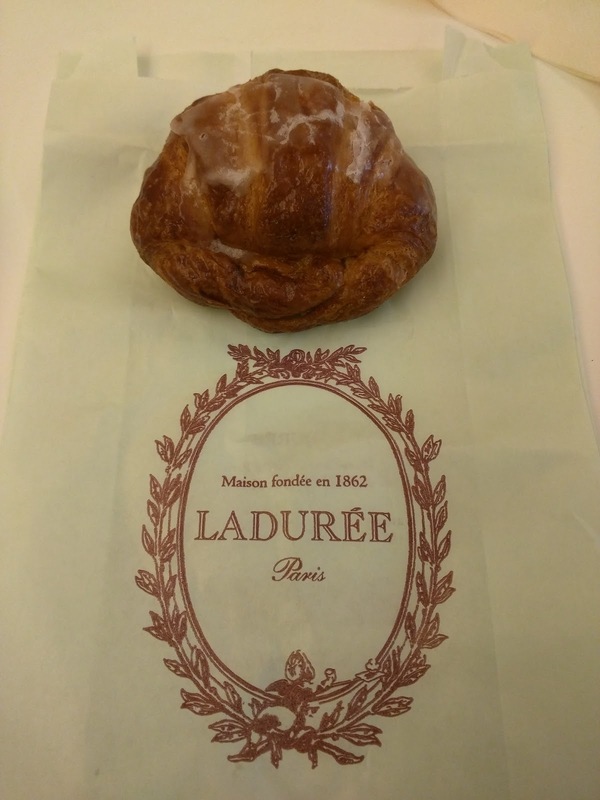 I didn't try the chocolate croissant, but the plain croissant was very generic, a bit spongy, a bit crusty on the outside, clearly not very fresh or quality. The raisin snail was worse. The second morning, after discovering the condiment station, I tried a (cold) pancake. Maple syrup saved it slightly, but I still don't understand the cold pancakes thing. Is this normal in Europe? 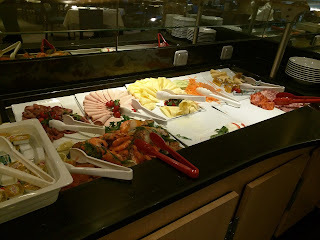 The condiment station was back behind the buffet, where I didn't see it the first day. It did have mayonnaise, mustard, and ketchup, along with balsamic vinegar, maple syrup, and a few other things. And hand wipes, random, but, useful, particularly in a buffet setting. A cut fruit lineup came next, with hard kiwi, mediocre grapes, and assorted other fruit I didn't try. Behind the cut fruit was lines of parfaits. I got one, but the granola layer was soggy (who knows how long ago these were composed! ), the yogurt was too tart for my liking, the strawberries weren't ripe. The only thing I liked was the raspberries on top. And last, a selection of meats, cheeses, and ... seafood. I didn't try the roast beef or ham, but the salami was oily and not great, and the mortadella was too spiced, in a strange way. The sliced cheese was generic, and the swiss was the same as they had in the lounge. For seafood, there was mushy smoked salmon, shrimp that I didn't try, and some kind of spiced white fish that was ok. This section looked much better than it tasted. Paris is a land of many famous pâtisseries, but even amongst the slew, Ladurée is one of the more famous. They have been around since the 1860s, have many locations at this point, and are famed for their macarons in particular. The macarons have an interesting history, added to the bakery lineup in the 1930s, when they also added a tearoom adjacent to the bakery since ladies weren't allowed in cafes (!). 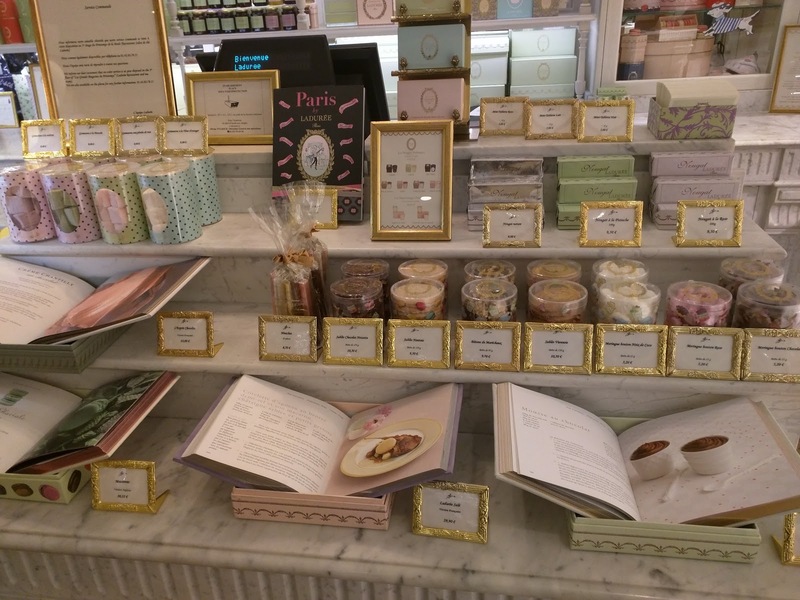 But Ladurée stayed a single bakery until far more recently, when they were bought by the same parent company as the monolith Paul (which I've reviewed before), and soon added a few other Paris locations in the 1990s, and then, eventually, global expansion in the 2000s. One night, I wanted a sweet treat, so I stopped by the Ladurée location that just happened to be located between my office and hotel (I didn't plan this, I swear!). I didn't have good selections that night, and wound up dissatisfied, so, I also visited a second time in the morning. That visit was even worse. 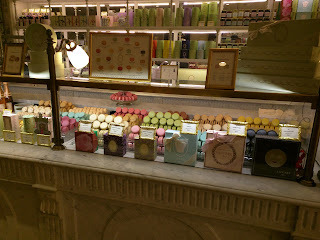 Granted, I never tried the macarons (because, meh, boring), but Ladurée wasn't worth any accolades in my book. The location I visited isn't the original. It is located inside the fancy Printemps women's department store, which I walked by every day on my way to my hotel from the office. Goodies are available to take away, or they have a small seating area on the side. As I said, Ladurée is famous for macarons, and the first display case you encounter is filled with their signature item, in a variety of colors and flavors. The first day of our trip, Ojan and I swung through to scope it out. We visited in the early afternoon, and they pastry case was loaded up. 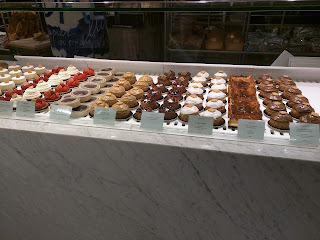 I had my eyes on a few things, including the St. Honoré (available in a slew of varieties), or perhaps the mille-fuielle, as I planned to sample many of these in Paris (like the one I tried at Pierre Hermé. 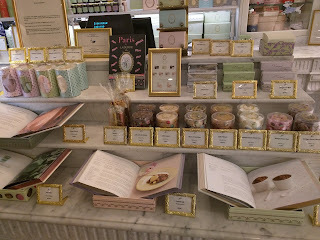 They also have a section with little packaged cookies, meringues, and of course, the new hotness, flavored marshmallows. But on the visit where I planned to get something, I was devastated when I walked in. They had, exactly 3 desserts left! Note to self: do not stop by a pâtisserie at 7pm! Still, I wanted something. So, I eyed my options. There was one little tart thing available in cherry or pineapple. 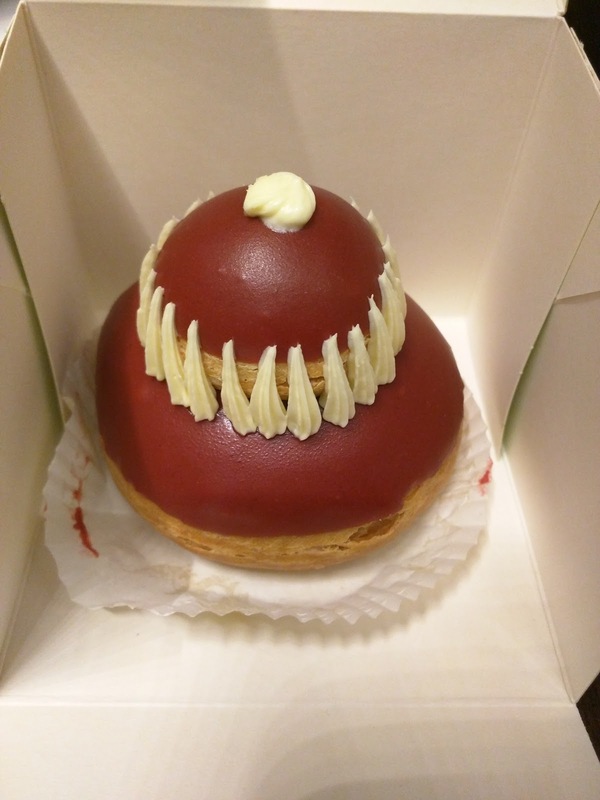 Or a double decker choux pastry with cherry. The person taking my order said that one had more cream filling, and clearly, cream wins, so I went for it. Still, I wasn't excited. Just like at Pierre Hermé, the packaging was a bit frilly and extensive, although at least this was a box with structural integrity. So what was it that I wound up with? A cherry version of the Religieuse, another treat that Ladurée makes in several varieties, but only the cherry one was left at that time. "Choux pastry, blancmange cream, sour cherry compote, sour cherries." Once I got home, I read the description. Uh, sour cherry? The person taking my order said "cherry". I probably wouldn't have gotten this if I knew it was sour cherry. Still, I persevered. Choux pastry, and cream filling, can be great. The treat was two layers, both the same, just one smaller than the other. Choux pastry, stuffed with sour cherry compote, glazed and decorated. The 5.75€ price I guess was fine? I don't really know the going rate for pastries like this. I dug in with the provided adorable little spoon. Um. Where was the cream? If this one had more cream than the other item offered, then I really don't understand what was in the other one. The choux pastry was totally unremarkable. The glaze was very sweet, white chocolate perhaps? The filling was in several layers, mostly a sour cherry compote. It was ... sour cherry. There were also some stewed sour cherries. And a thin layer of almond paste against the bottom pastry. And yes, a very, very thin layer of cream on top. The top ball had more cream in it, but neither layer was what I'd call a cream filled treat. Sour cherry, yes. Cream, no. So, I didn't like this. I felt a bit mislead, as the merchant said this was filled with cream and that it was cherry. But even so, this is just not ever something I'd pick, given more options. I just didn't have options. The only thing I really liked was the sweet glaze, just because it was sweet. Croissant aux Noix, Mini. 1.15€. "Ladurée Croissant filled with almonds, hazelnuts and walnuts." Another morning, I really wanted a fancy pastry for breakfast, but I was also feeling lazy, and didn't want to venture far. 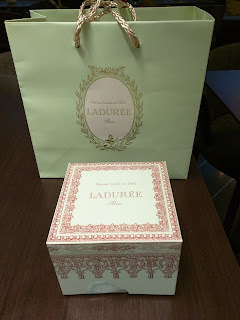 So I opted to swing back by Ladurée to check out their selection of viennoiserie. Unlike the macaroons and cakes, these items were all hidden from sight, not in a grand display case, but a menu was available. I had no way to see what items looked like. So I settled for the "Croissant aux Noix", the nut croissant. I saw it was available in a large or small size, so opted for small, since I wasn't actually thrilled with the choices before me. I'll be blunt. 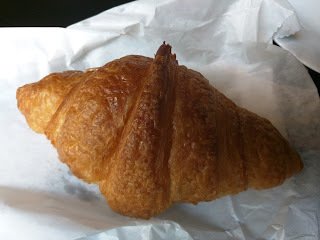 This was one of the worst croissants I had in Paris. Perhaps on par with the ones from my hotel? My office had better. Every random place I stumbled into had better. The croissant itself was ... spongy? It wasn't flaky, it wasn't buttery, it just wasn't good. Just like the pastry I had earlier, literally, the only aspect I liked was the glaze on top. Inside was a bit of a ground/chopped nut filling, sweetened, and tasty. But when surrounded by such awful pastry, it didn't matter. I honestly wondered if these were day olds. That would explain also how he had sold out of the chocolate nut croissants only 5 minutes after opening? I was glad I got a mini. I guess the 1.15€ price was ok, but some of the less fancy places all had full size treats for this price, and minis for < 1€, so I wasn't impressed with the low price either.